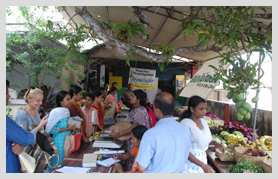 Eco-Farmers Market is a IT-enabled platform created by ASHA (Alliance for Sustainable and Holistic Agriculture) for facilitating better information flows that would assist marketing of produce from ecological agriculture and therefore, support the livelihoods of farmers who are making the difficult shift for the better in their farming practices and approaches. This is a platform that seeks to connect registered organic producers with registered procurers of such produce mainly in the form of procurers and distributors. Very often, in the ecological farming world, one comes across farmers complaining that they are not able to find supportive markets for their entire produce. After all, this produce is of high quality, very different from the chemical-laden conventional produce and selling this produce in the regular markets is very disheartening. On the other hand, one also comes across procurers often complaining that their supply chains are erratic and that they are unable to procure a variety of produce throughout the year. A part of the problem – admittedly, may not be the most crucial of the problems in the supply chain – appears to be lack of adequate and appropriate information flows that could connect producers with procurers. It is in this context that we in ASHA conceived of this web-based portal to facilitate information flows that could enhance marketing support for organic produce. Through this effort, we hope that producers will find sensitive buyers who will leave enough room for the producers to fix their expected price based on the costs and other efforts incurred, and in turn that the buyers will find sensitive consumers who will come forward to consume organic produce with fair trade principles upheld. For the procurers, we hope that this effort would help in supporting producers closest to them and in the process also reduce food miles for the consumers.For ASHA, this is a not-for-profit effort, and the actual trade transactions are left to the producer and procurer in each case, with the portal being an information-sharing platform only. HOW DOES ECO-FARMERS MARKET WORK? On this website, we have registered organic producers who want to look for potential buyers through this effort. These producers are from various states of India, and could be classified as “declared” organic, “certified” organic (third party certification) and “guaranteed” organic (ones who are part of a PGS mechanism). Care is being taken to make sure that all the producers are re-verified for their ‘organicity’ by a panel of credible and trustworthy referees in each state. It is apparent why the panel of referees would not be revealed here. It is also being ensured that only fully-organic producers are listed here (not ones who do partial organic and partial chemical farming), so that even inadvertent mixing-up of produce at the farmer’s level does not happen. However, the final checks with regard to the ‘organicity’ of the produce being purchased have to be evolved by each procurer. Similarly, we have a set of registered procurers (distributors and procurers mainly) from all over India who are potential buyers of the organic produce of the registered buyers. 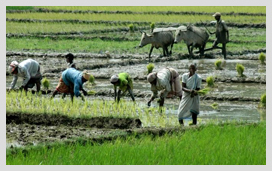 With the help of call agents as well as IVR facility in a second stage, information related to availability of various products with the registered farmers would be updated on a regular basis into the portal’s database (the planned frequency of updation is every 10 days for each producer). Such updated information would then be available to the procurers upon queries that they pose with regard to particular products, locations or kind of farmers (certified only, for instance). Queries will be answered with data related to who has the product to offer, in what quantities and with what expected price. Once the zeroing in on producers happens for the procurers looking for particular kind of products in particular quantities, they can contact the producers directly for finalizing details of the actual transactions. We hope that over a period of time, a set of procurers will have loyal business transactions with a set of producers to the point that this portal’s services become redundant, or can move on to cater to the requirements of other producers and procurers. This effort has been supported by financial contribution by Welthungerhilfe (through Pravah and Forum For Integrated Development). A-124/6, First Floor, Katwaria Sarai, New Delhi 110 016.